Mingtai MT1800 luxury model obstetric operating electric table is the company follow the principle of human body engineering science and technology personnel development and design of new products, it has from bed to bed delivery automatic conversion function, equipped with lifting of neonatal receiving station, and optional electronic induction scale and auxiliary functions such as CD, advocating a new concept of obstetric delivery. The bed is mainly original parts choose foreign brands, quality is reliable. Product design is reasonable, the craft is advanced, is now the most advanced domestic delivery in bed. 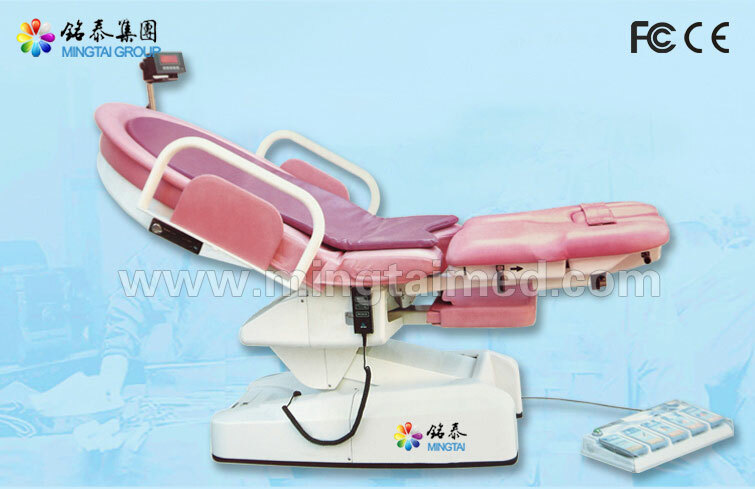 Simple operation, can complete smoothly from the bed to the transition of the obstetric table. Foot supporting department according to the women's status and delivery status about automatic open and close respectively: copy, foot department Angle can be adjusted according to the way of delivery, can be used in the supine position, use the sitting position, lateral position, half supine position, tonnage, prostrate position of childbirth a variety of ways. All kinds of new function and excellent operability, the bed can achieve satisfactory delivery, is the first choice for each hospital obstetrics with bed. Looking for ideal Ordinary Obstetric Birthing Table Manufacturer & supplier ? We have a wide selection at great prices to help you get creative. All the Universal Operating Table are quality guaranteed. We are China Origin Factory of Hospital Delivery Table. If you have any question, please feel free to contact us.